After the Supreme Court’s second day of oral arguments, back on March 27, there was a sense that the justices were not sold on the health care law. And with good reason. The justices were very skeptical of the thrust of the government’s case -- that the mandate was justified under the so-called “commerce clause” of the Constitution and the government’s right to regulate markets. It was clear Chief Justice Roberts and Justice Anthony Kennedy, usually a swing vote, were skeptical of the “commerce clause” argument, especially how it could be limited to the health care market. And star conservative lawyer Paul Clement, who argued for the states that filed suit against the law, focused his case on it. 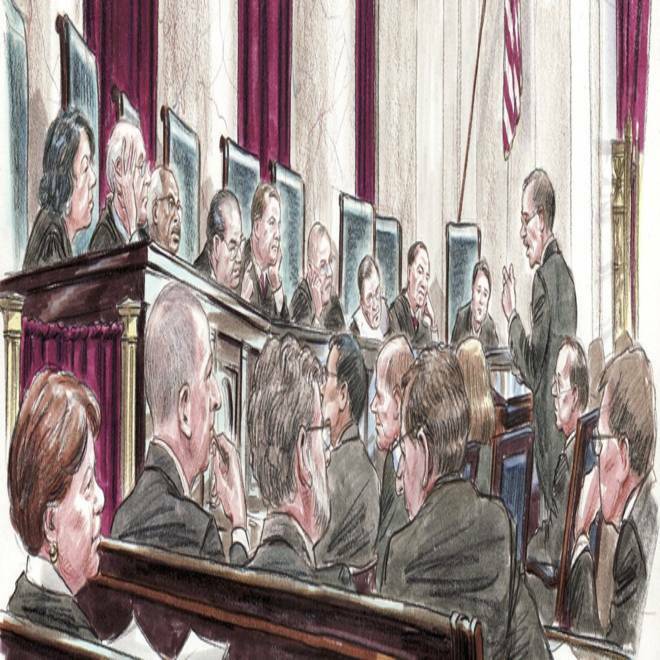 In this courtroom illustration, U.S. Solicitor General Donald Verrilli (R) speaks at the lectern to members of the U.S. Supreme Court in Washington March 27, 2012. The rough day in court for the government led some to criticize the government’s lawyer, Solicitor General Donald Verrilli. The Republican National Committee went so far as to mock Verrilli with this video, focusing on style -- a pause and stammer. But court arguments are not television anchor tryouts; they’re about the merits of an argument, and a review of the transcript of the oral arguments from that day (with the benefit of hindsight, of course) finds Verrilli made a strong case for the government’s taxing power. While the taxing power argument was certainly not the focus of post-oral arguments analyses, it was the one that eventually won the day. And though Chief Justice John Roberts gave few clues that he might be leaning toward the argument, there were some signs he might have been warmer to the government’s case than some thought. The heart of Verrilli’s argument, that the mandate should be considered justified under the Congress’ taxing power, seemed to center on this point, which he made twice that day -- that the mandate would be administered by the Internal Revenue Service, the agency responsible for taxation. Verrilli fended off tough questions from nearly all the justices on the taxing power argument, from the court's conservatives to liberals. Some of the toughest questioning came as it related to the president and members of Congress arguing the mandate was not a tax. But Verrilli countered that: (1) Some members of Congress did argue that the mandate would be valid under the taxing power, and (2) that shouldn’t matter; that it’s up to the court to decide what’s justified under the law, not the rhetoric of politicians. JUSTICE KAGAN: I suppose, though, General, one question is whether the determined efforts of Congress not to refer to this as a tax make a difference. I mean, you're suggesting we should just look to the practical operation. We shouldn't look at labels. And that seems right, except that here we have a case in which Congress determinedly said, this is not a tax, and the question is why should that be irrelevant? GENERAL VERRILLI: I don't think that that's a fair characterization of the actions of Congress here, Justice Kagan. On the -- December 23rd, a point of constitutional order was called, too, in fact, with respect to this law. The floor sponsor, Senator Baucus, defended it as an exercise of the taxing power. In his response to the point of order, the Senate voted 60 to 39 on that proposition. The legislative history is replete with members of Congress explaining that this law is constitutional as an exercise of the taxing power. It was attacked as a tax by its opponents. So I don't think this is a situation where you can say that Congress was avoiding any mention of the tax power. It would be one thing if Congress explicitly disavowed an exercise of the tax power. But given that it hasn't done so, it seems to me that it's -- not only is it fair to read this as an exercise of the tax power, but this Court has got an obligation to construe it as an exercise of the tax power, if it can be upheld on that basis. JUSTICE SCALIA: You're saying that all the discussion we had earlier about how this is one big uniform scheme and the Commerce Clause, blah, blah, blah, it really doesn't matter. This is a tax and the Federal Government could simply have said, without all of the rest of this legislation, could simply have said, everybody who doesn't buy health insurance at a certain age will be taxed so much money, right? JUSTICE SCALIA: You didn't need that. If it's a tax, it's only -- raising money is enough. GENERAL VERRILLI: It is justifiable under its tax power. And perhaps most telling, here’s Verrilli’s most extended exchange with Roberts on taxing authority in which Verrilli admits the likely political considerations for the president and members of Congress not calling it a tax. That admission may have clarified things and won the day.